I'm sorry to talk to you about this so early in the morning. No, I take that back, I'm not. I don't think there has EVER been a time I have made a single recipe that included more butter, than this one I am about to show you. That also includes my time in culinary school AND all of my restaurant days. This recipe would make Paula Deen so happy. Well actually, this recipe would make the old Paula happy. The last time I heard, she was on a health kick and losing major weight because of heart problems and diabetes warnings... Scratch this whole point altogether. There is so much butter used! Consider yourself warned. Deliciously warned, that is. Because lets be honest, if we didn't have things like...hearts...or blood pressure, arteries, etc...we'd all be eating gobs and gobs of this stuff. Bacon dipped in butter to be exact. Oooo or bacon sautéed in a browned butter sauce, poured over a bed of butter. But alas, we were made with body parts that are indeed there for our own good and health and stuff and blah blah. So, because of this fact, all things butter, sugar, frosting, cake, pies, dessert...ooey and gooey, dripping...sopping in ooey gooey dripping frosting should, in fact, be consumed on a very RARE basis. Sad faces unite. 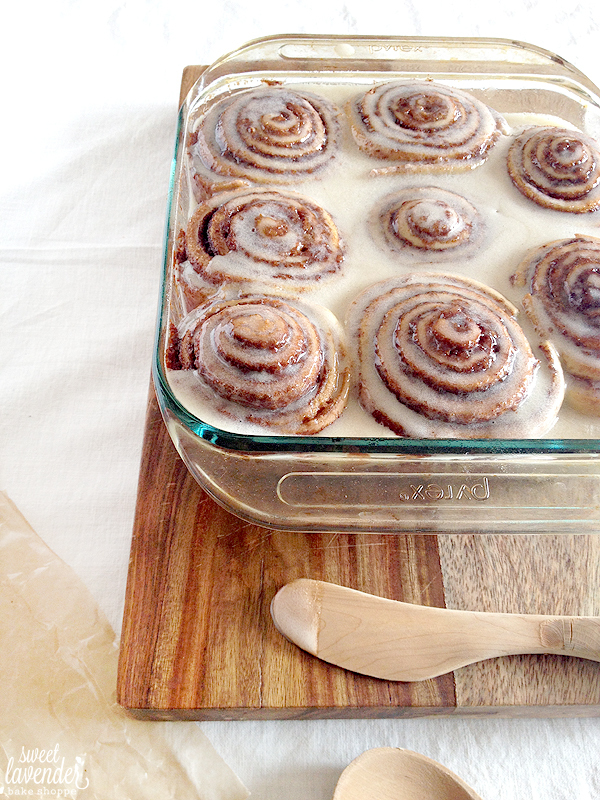 That's what this recipe is all about: Butter + Ooey + Gooey + Dripping and Sopping Frosting-ness. All things fattening and delicious. Boy, do I mean delicious. If you're still on board, as you should be, then I recommend this recipe be made as soon as you have 1,000,000 calories to spare. There are quite a few steps, but please don't let that stop you- I assure you they are EASY steps. Just a tad time consuming (as are a lot of homemade bread-type things). 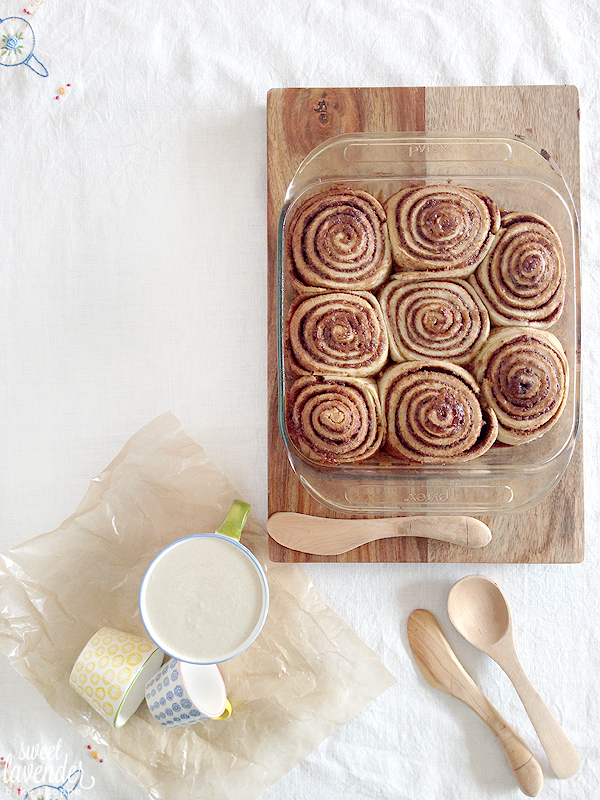 Set aside a Sunday afternoon, gather in your kitchen with your family, and make this together. It's that easy. My husband, Mr. Can't Bake for Squat made these...and seriously, if he can, anyone can. They were SO good and totally rewarding for all your "hard" work! 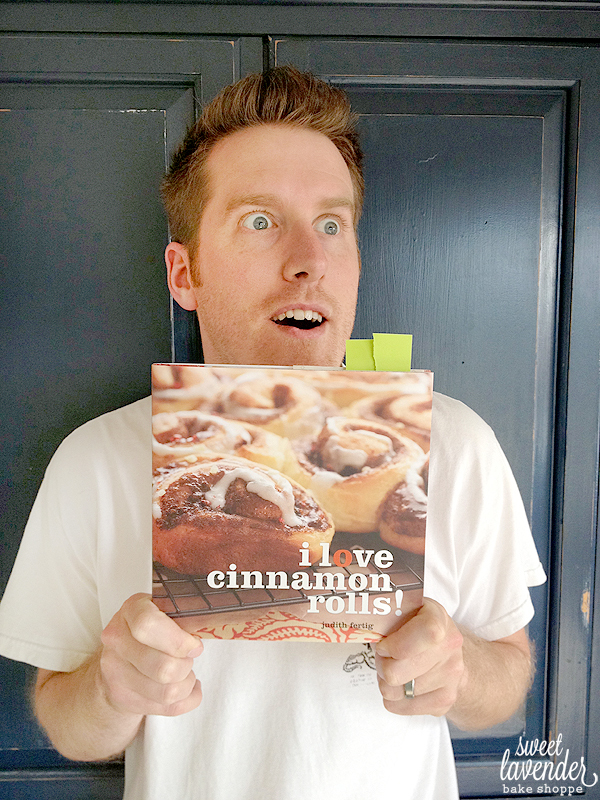 My husband's love for cinnamon rolls should be outlawed. Dead serious. 1. In a small saucepan, add your milk, butter, vanilla sugar and salt. Gently heat over medium low until warm to the touch (or temperature reaches 110°F on a thermometer). While heating up, whisk eggs in a medium-large bowl. Once milk mix is heated up, remove from heat and slowly pour into whisked eggs, whisking the entire time. Set aside. 2. In the bowl of a stand mixer (with a paddle attachment), add your flour and yeast. While mixer is on low speed, slowly pour in your milk/egg mix. Continue to mix on low until the dough is completely incorporated and starts to pull away from the bowl- about 5 minutes. Stop and scrape down sides of bowl, as needed. 3. Next, remove paddle attachement, switch to the dough hook and knead the dough in the mixer on low speed- about 5-6 minutes. Sprinkle dough with more flour (tablespoon at a time) if necessary, to keep from sticking to the sides. Knead until dough stops sticking to the sides of bowl, is smooth, and springs back when pressed with your finger. 4. Remove dough from mixer bowl and add to another lightly greased bowl. Cover top with a hand towel and allow to rest and proof in a warm area, for about 45 minutes to an hour. It will have almost doubled in size! 1. In an 8"x8" glass or metal baking dish, spread the butter along the bottom and up the sides. Keep butter heavy along the bottom and lighter up the sides. Combine cinnamon and vanilla bean sugar, and sprinkle over the bottom of the dish, over the butter. Set aside. 1. 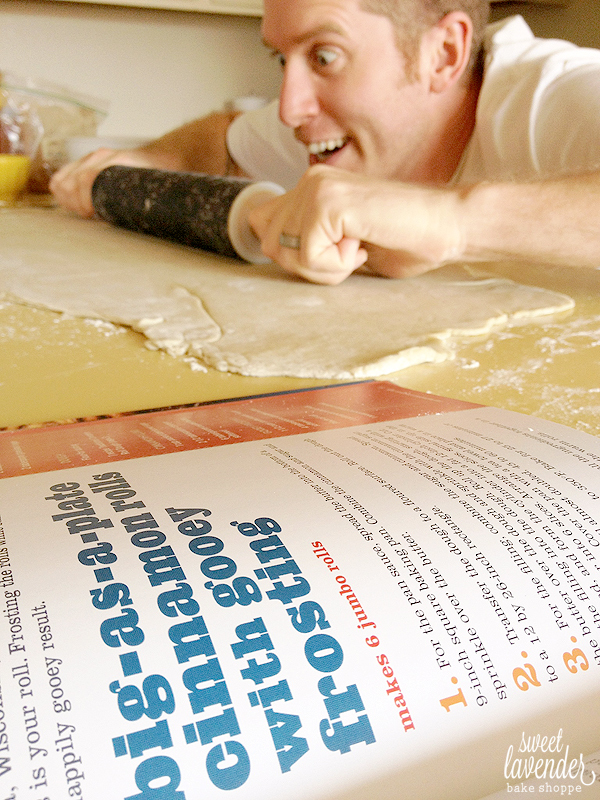 Transfer dough to a lightly floured surface and roll out until it is about 1'x2'. 2. In another bowl, combine your brown sugar and 3 tablespoons of ground cinnamon. Spread your 6 tablespoons of softened butter over the surface of your rolled out dough and then top with your brown sugar/cinnamon mix. Smooth sugar out so it is covering the butter evenly and press gently so sugar mix is really adhered. 3. Roll up dough as tight as you can, from one of the shorter ends, and form into a fat foot-long cylinder. With a serrated knife, cut your log into 8 slices. If your log's length is shorter than a foot, cut into less slices. Arrange each piece, spiral side up, in your buttered/sugared pan and then cover the top with your hand towel. Place pan back in a warm area and again, allow to rise- about 45 minutes to an hour more. 4. Once rolls have risen and puffed, preheat oven to 350°F and bake, uncovered, for about 25 minutes or until risen and golden brown. 1. For the frosting, simply whisk together your powdered sugar (unsifted is fine), butter, salt, greek yogurt, and vanilla extract until totally combined. 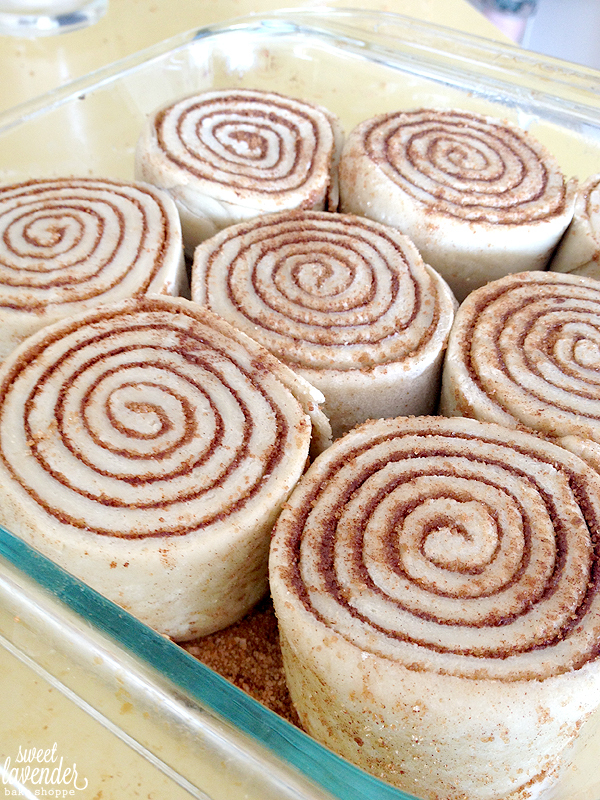 Pour and spread over fresh, out of the oven, rolls. Let sit 5 minutes to cool JUST slightly. I mean, really? REALLY?! These little bits of fattening, caloric goodness are maybe the most amazing things ever made in our home kitchen. Yes. Yes he does. Don't believe me? Check this, this and this out. I checked and I have all those ingredients on hand. I'm so EXCITED to make these!!!!!!!!!!!!!!!!!!!!!! I LOVE LOVE LOVE!!! 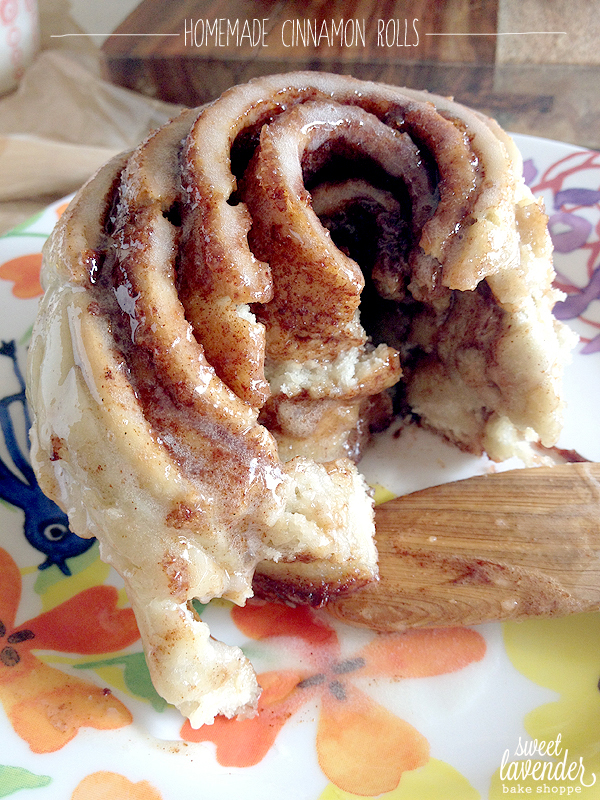 cinnamon rolls! Oh my gosh Sabrina! You're going to DIE!!!! SO GOODDDDDDDDDDDDDDDDDDDDD!!! HAHAHAHA!!! You seriously just cracked me up! Holy Crow, look at all that frosting! 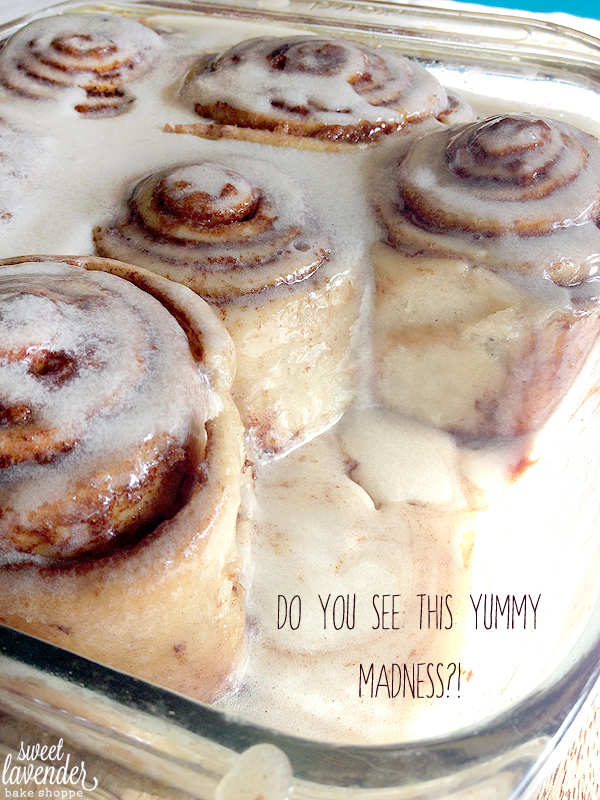 This must be the cinnamon rolls they serve in heaven. 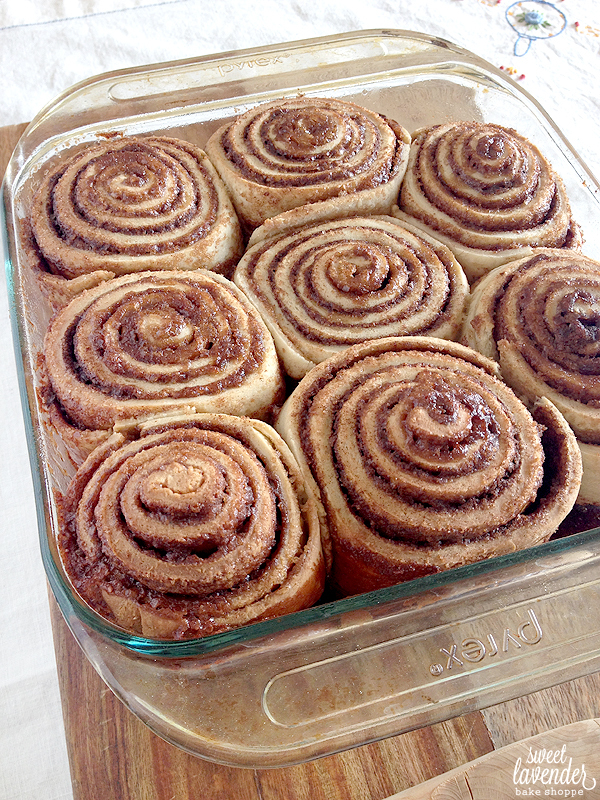 These cinnamon rolls look perfect!! So pretty, and I love how much cinnamon is in them! 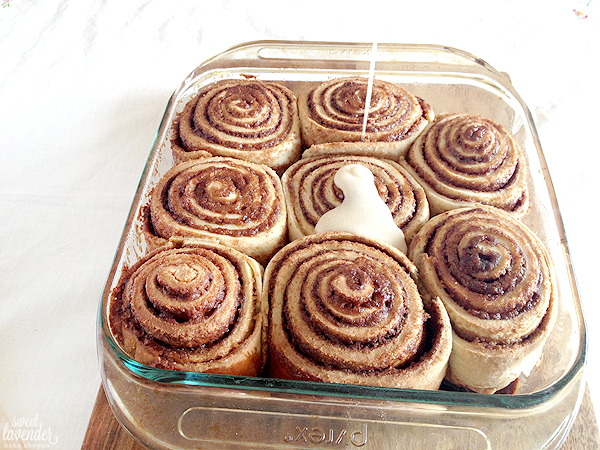 I don't know if I can make these because I would seriously eat the entire pan! Those look so delicious....I couldn't read other posts because I keep going back to this one. :)' Will be trying these soon...hopefully I can share with others! Thanks for the recipe. This post made me lauughhhh, I wonder if there is anything my boyfriend loves enough to look that enthusiastic in the kitchen..? :) lovely post and DIVINE looking recipe! SO glad you guys all got a good laugh at my hubbie! He'd be so happy to hear!!! He's truly a crack up, that's for sure! Can I have a dozen please? 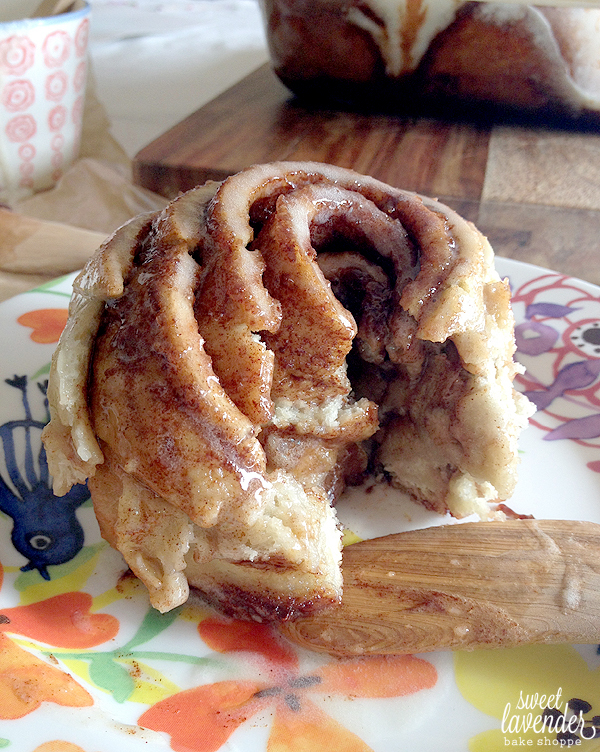 These may be the best looking cinnamon rolls ever!! !